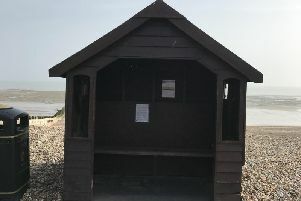 Worthing Borough Council has refused plans to open a pay and display car park in a conservation area. An application, for the forecourt of the vacant Grove Car Centre in Portland Road, was considered at a meeting of the council’s planning committee on Wednesday evening (November 21). The application asked permission to mark out eight parking bays and install a pay-and-display meter, with no work included for the showroom itself. In the council’s conservation area appraisal for the Chapel Road area, it is suggested that the showroom be redeveloped ‘so as to enhance the character and appearance of the conservation area’. As such, the use of only the forecourt was seen as a missed opportunity by some. Susan Belton, chairman of the Worthing Society heritage and conservation group, said that while the group did ‘appreciate the need for economic development in the town centre’, members felt the car park would not enhance the character or appearance of the area. However, applicant Nick Brewer said the car park would be the first stage of a plan to develop the showroom into a sports retail shop. He added that the impact of the car park would be ‘insignificant compared to the existing use of the site’ and that the eight spaces would ‘contribute greatly to the over-stretched parking we have in the area’. While some members supported the application, stating that ‘anything that eases the parking pressures in the town centre can only be a good thing’, others had concerns. Some suggested the car park could be given temporary permission, while others wondered why the plans for the sports shop had not been included in the application. Committee chairman Paul Yallop (Con, Marine) said: “The committee debated this application at length. Consideration was given to granting a temporary three-year permission but the applicants felt that would not suit their requirements.